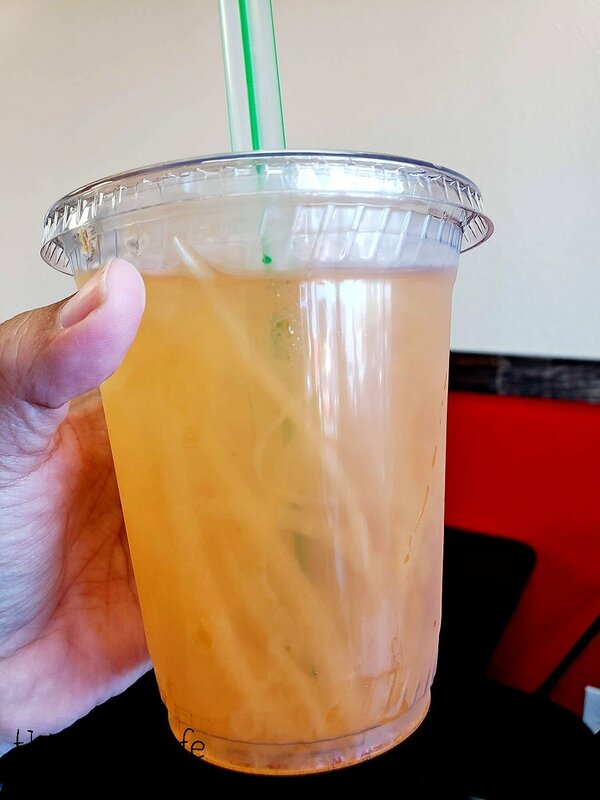 I dropped all other planned posts because I hadn’t started them yet AND I wanted to tell you about this brand spankin’ new spot in Paradise Hills that just opened a little over a week ago! 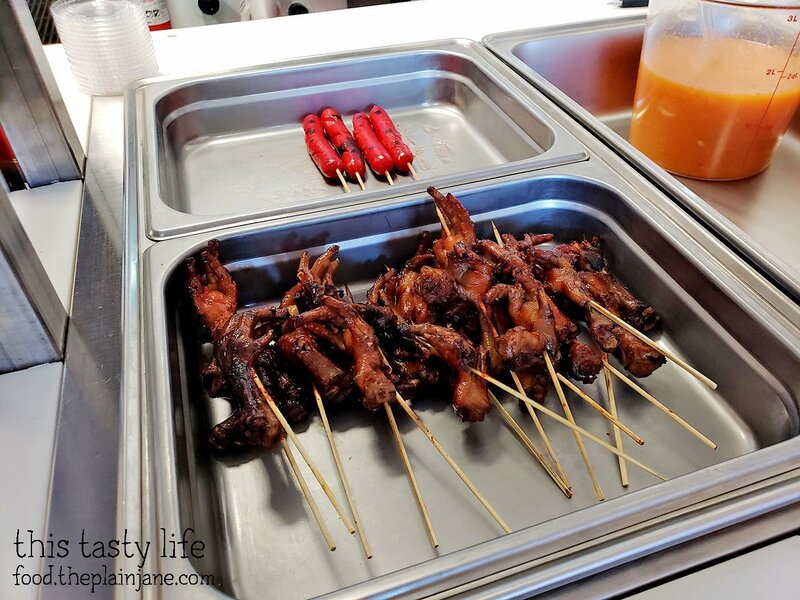 It’s called Tambayan Filipino BBQ & Grill! Jake and I were preparing to go to the movies to see “Tag” (which was pretty good, by the way) and I found this new spot via Yelp. The thing that made me want to go here… $1 BBQ Grill Sticks! ONE DOLLA! 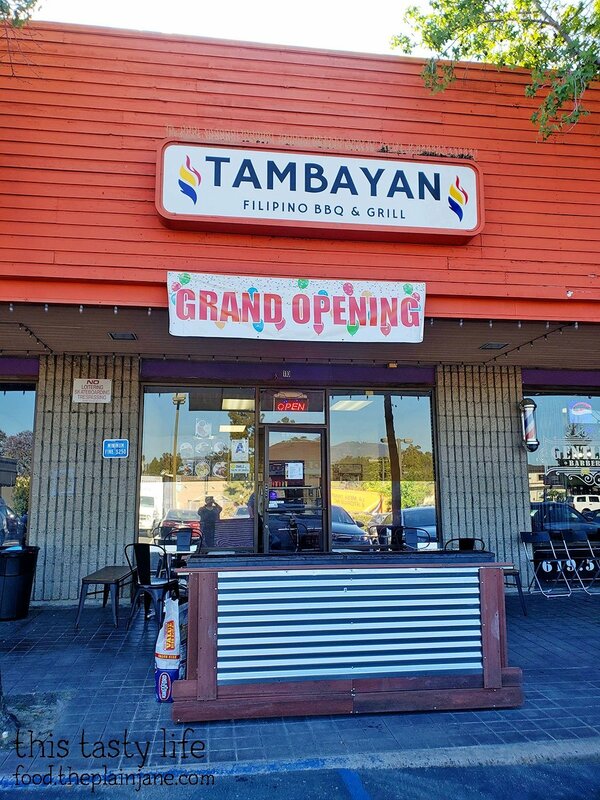 When we went to Tambayan Filipino BBQ & Grill last night, we were told they had been opened for 8 days. That’s it! Right out front you see this grill that’s full of charcoal and heating away nicely. This is so you can reheat your grill sticks! More on that in a minute. 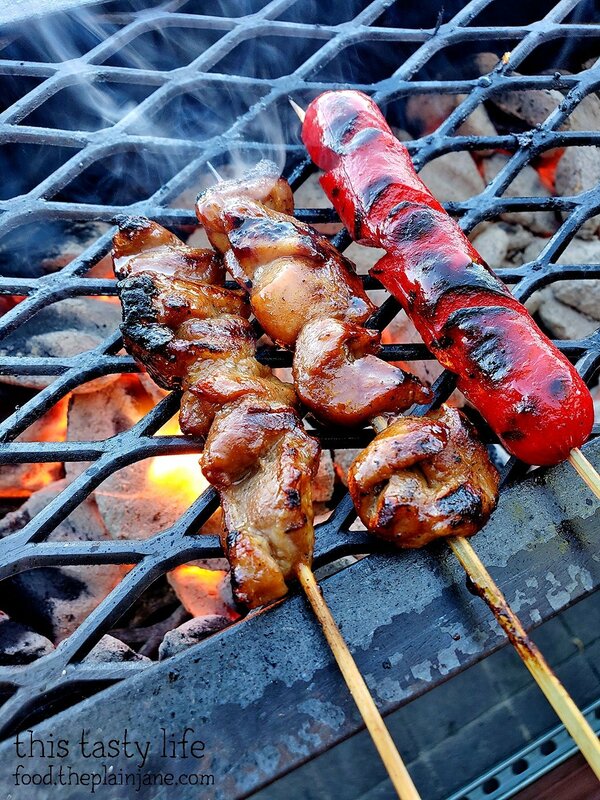 Here’s the menu for Tambayan Filipino BBQ & Grill. They do Silog Combination Plates which are like breakfast plates that come with garlic rice and an egg on top. They have these breakfast combos available all day and we were told you can do half and half combination of most dishes (exceptions were corned beef and fried chicken). You can also do combinations on the BBQ plates. Chicken, Pork Intestine, Pork, and Pork Ears. 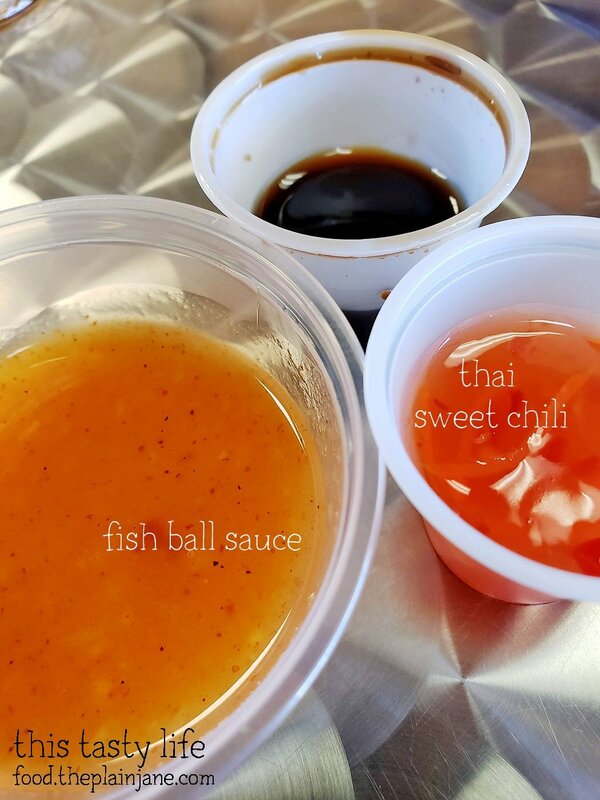 We were told to try the Fish Ball sauce which is sort of like a sweet and sour sauce that’s made by the chef here at Tambayan Filipino BBQ & Grill. I really loved this sauce! 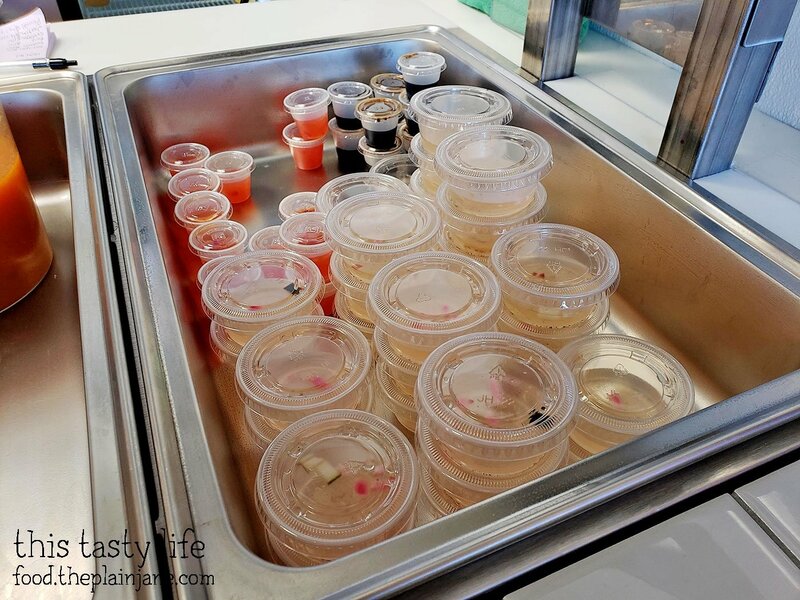 It has a nice sweet component to it that tasted wonderful with…. like…. EVERYTHING. I used it with the BBQ sticks, the lumpia, and even our short rib meat. All purpose sauce if you ask me! They were out of coconut juice but we did try the fresh Melon Juice for $1. It has strips of melon in it! This tasted just like eating a fresh ripe melon! Mmmm… the grill sticks. 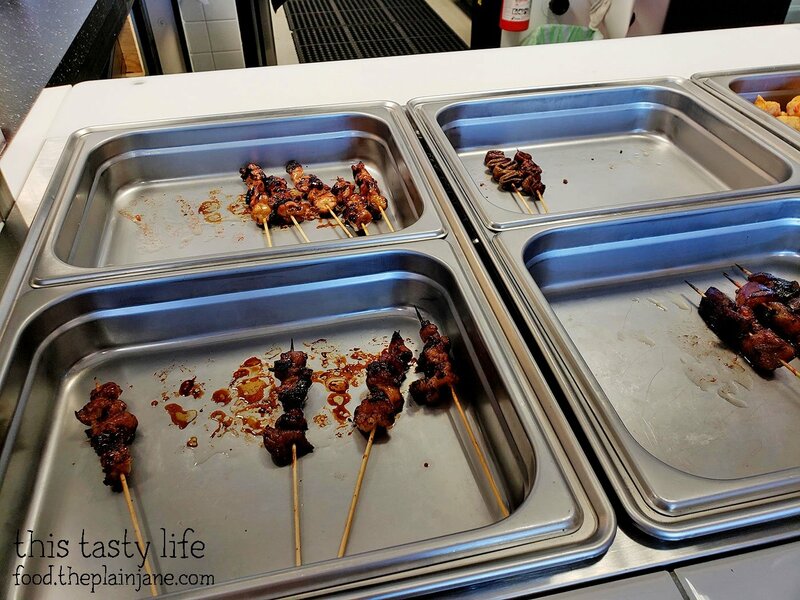 I really like that they have a grill outside for you to reheat your sticks at Tambayan Filipino BBQ & Grill. You can cook them up to your liking. I got our sticks sizzling with a little extra char on the outside. These have a really simple marinade on them and they tasted wonderful – juicy and flavorful! My favorite of the three was the chicken. Jake liked the pork the best. We both agreed the hot dog was fine, but we would probably skip it next time because it’s… well… a hot dog. We’d rather have something else! 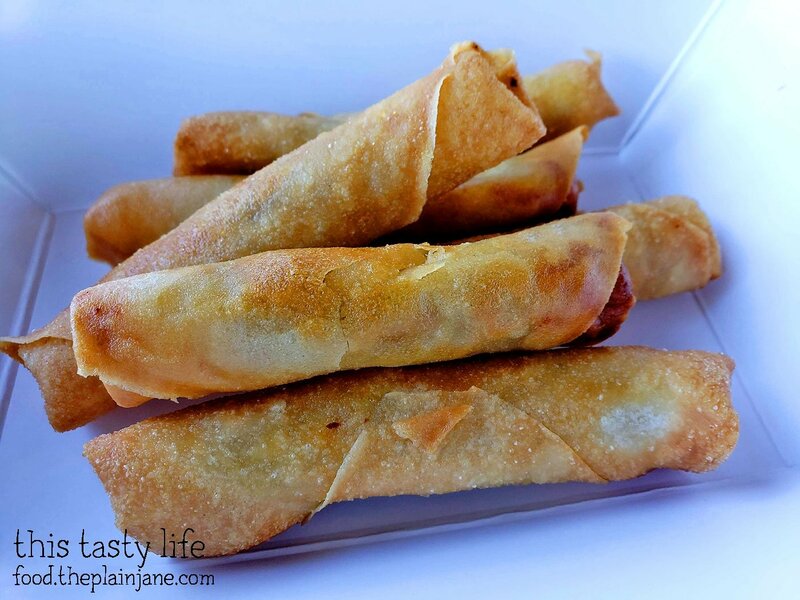 The lumpia at Tambayan Filipino BBQ & Grill is 3 pieces for $1. OH YES! These are a decent size and they tasted GREAT. The filling was a pork mixture that had a slight sweetness to it. 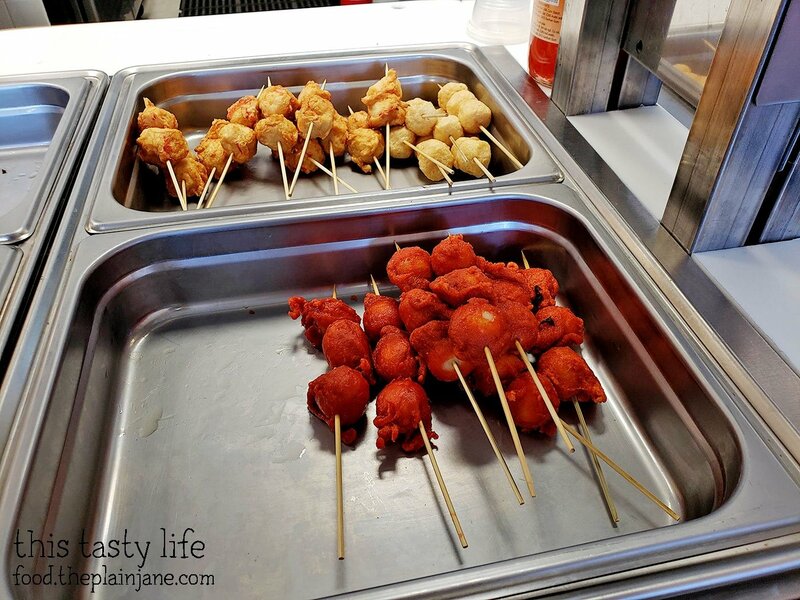 These were perfectly crisp and I loved the flavor of them, especially with that fish ball sauce! I really enjoyed the lumpia and for that price point I would definitely want a couple of orders to myself… totally worth it! 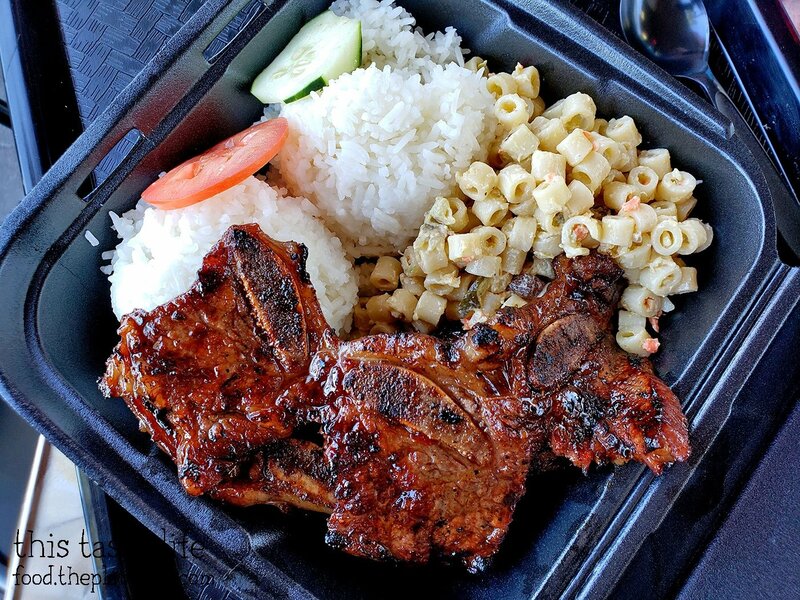 For our last item, Jake and I shared the Short Rib Plate [$8.99] which came with two scoops of rice and macaroni salad. It also comes with a soup which we declined to get. I wanted to like the macaroni salad because it didn’t look mayonnaise heavy, but it had raisins in it and I think relish or pickles or something… I didn’t taste either of those at first and then I bit into a raisin and I was done. The flavor didn’t do it for me, but I’m sure other people would love this stuff. The short ribs were awesome! They have a great flavorful marinade on them and were grilled perfectly. The beef was quite juicy and the marinade wasn’t too overpowering on the meat. It wasn’t too fatty, either, which just a few fatty bits on the end were the bones were. Jake commented that he had “never had rice like this” – it was the sticky kind of rice that kind of smooshes and stays together. I’ve had it before so it wasn’t anything new to me, but he seemed enamored with it! Ha. 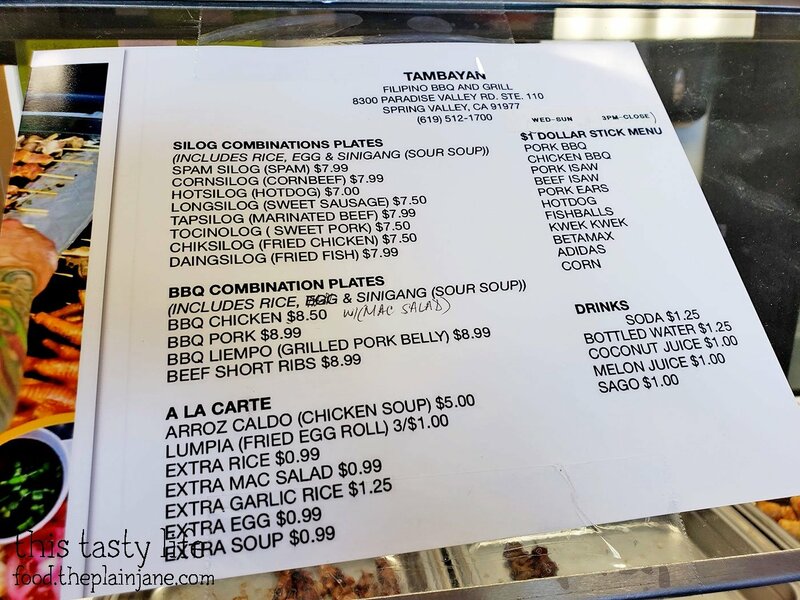 Jake and I really enjoyed the food we had at Tambayan Filipino BBQ & Grill and at this price point, it was so affordable as well as being delicious! We had great service from the staff who explained the menu to us and told us what was good and what to try, which we really appreciated as well. Go check them out and get some BBQ sticks! Awesome! This is comfort food for me, those garlic rice/egg/meat of choice plates. I would like that mac salad too (I like relish and raisins in mine). My favorites are tapa, tocino or longganisa. Not very healthy for everyday, but ok once on a while. Their skewers have street food nicknames (walkman = pig ears, Adidas = chicken feet and beta max = coagulated and grilled blood cubes). Yeah we asked what a few of the items were since I wasn’t familiar with the nicknames! I definitely want to go back to try the other combinations and get more sticks (and lumpia)! The BBQ sticks are fun!! Try going in the afternoon if you can to try those $1 sticks. And some lumpia!